Monsanto Co. is facing hundreds of Roundup lawsuits filed by farmers, farm workers, gardeners, landscapers, government workers and a host of other individuals from all across the nation who allege exposure to Roundup weed killer caused them to develop non-Hodgkin lymphoma, and that Monsanto concealed health risks associated with its blockbuster herbicide. Dozens of these cases were consolidated into a multi-district litigation (MDL) before U.S. District Judge Vince Chhabria in the Northern District of California. In March of 2017, Judge Chhabria issued a ruling against Monsanto that allowed documents obtained in discovery by the Plaintiffs’ Executive Committee overseeing MDL-2741 (In Re: Roundup Products Liability Litigation) to be unsealed. These court documents are known as the Monsanto Papers. 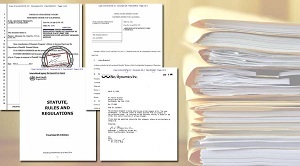 Below are unsealed court documents, including internal Monsanto memos and emails between employees, along with a host of other information on the litigation. European Parliament requesting U.S. court documents in Monsanto Roundup litigation (3 pages) (7.13.17) – Four members of EU Parliament wrote a letter to U.S. District Judge Vince Chhabria asking for access to court documents from the Roundup cancer litigation. The letter expressed “strong doubts” on the validity of EU glyphosate assessments. Unredacted versions of plaintiffs’ motion to compel the production of kidney tissue slides and exhibits 1 and 4 (18 pages) (6.8.17) – Roundup cancer attorneys have hired an expert pathologist to analyze the tissue slides from a 1983 Monsanto rodent study on Glyphosate. The analysis could help prove that Monsanto covered up known health risks associated with glyphosate. Memo from Monsanto’s George Levinskas on kidney tumors (2 pages) (5.16.17) – In 1985, George Levinskas, Monsanto’s manager for environmental assessment and toxicology, sent an internal memo implying that a noted academic would review tissue slides from a 1983 glyphosate rodent study and present the evaluation to EPA “in an effort to persuade the agency” that tumors observed in the study weren’t related to glyphosate exposure. The memo was purportedly written before the academic, Dr. Marvin Kuschner, had even seen the slides. Plaintiffs’ reply in further support of motion to compel responses from Jess Rowland (9 pages) (5.10.17) – Former EPA official Jess Rowland is a central figure in the Monsanto Roundup litigation. Court documents show that Rowland allegedly had a cozy relationship with Monsanto while working at EPA. Jess Rowland’s opposition to motion to compel responses from Jess Rowland (23 pages) (5.9.17) – Former EPA official Jess Rowland, who allegedly had ties to Monsanto while working for the agency, asked the Court to deny Roundup cancer attorneys’ motion to compel further information, and to terminate his discovery obligation. Plaintiffs reply in support of motion to strike confidentiality of Heydens deposition (5 pages) (4.20.17) – Per court documents, Monsanto started the aptly-named “Let Nothing Go” program to leave nothing, not even Facebook comments, unanswered. According to the motion, “through a series of third parties, it [Monsanto] employs individuals who appear to have no connection to the industry, who in turn post positive comments on news articles and Facebook posts, defending Monsanto, its chemicals, and GMOs. Jess Rowland documents unsealed (115 pages), key documents on pp. 99-102. (3.14.17) – Per court documents, former EPA official Jess Rowland allegedly bragged to Monsanto executive William Heydens during a telephone conversation that he deserved a medal if he could kill another government agency’s investigation into glyphosate. “We would be keeping the cost down by us doing the writing and they would just edit and sign their names so to speak.” In the same email, Heydens cited a previous instance in which the company had already done this. Judge Vince Chhabria’s ruling to unseal documents (3.13.17) – U.S. District Judge Vince Chhabria, who is overseeing the Roundup cancer MDL in Northern California, threatened to sanction Monsanto if the agrochemical giant persisted in “overbroad” efforts to keep documents relevant to the litigation out of public view. Judge Chhabrias’s ruling allowed for the unsealing of thousands of court documents obtained in discovery. Plaintiffs’ reply in support of motion to compel deposition of Jess Rowland (2.27.17). Key document: Marion Copley letter on p. 11 (2.27.17) – Marion Copley worked at EPA for decades. She and Jess Rowland worked together. In a letter to Rowland, Copley urged him, “for once in your life, listen to me and don’t play your conniving games with the science to favor” the chemical industry. Copley’s letter goes on to say that Rowland and another EPA official “intimidated staff” into changing reports on glyphosate. GMOs need to be studied more rigously. There is much potential for them, but companies like Monsanto, DuPont, Bayer, etc. are not the right ways to do it, with their business practices and influence in mainstream sciences. Theres also studies showing harm from big bitech GMOs. There is a problem with fraud and unreporducabe studies in the mainstream sciences. The Corbett Report: Scientists Say Fraud Causing Crisis of Science - #NewWorldNextWeek See video description for sources.